President George H.W. 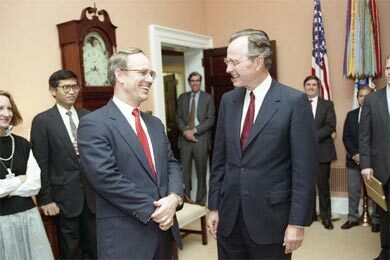 Bush, who had served as Reagan’s Vice President for eight years, had previously been a U.S. Representative from Texas, envoy to China, and Director of the Central Intelligence Agency, brought to the Oval Office deep prior experience and appreciation about how government worked. Bush’s view of a “kinder and gentler government” would mesh with his commitment to conservative regulatory policies. With the U.S. Securities and Exchange Commission, Bush would shape its work by handing its reins to Richard Breeden, who had proved himself an able colleague. Before Breeden took the oath as SEC Chairman, he requested a meeting with President Bush in the White House mess. He recalled that “President Bush was confident in my judgment and my experience. He said I always want you to be sure that you do what you think is right and not what you think is expedient, not what you think is easiest.”41 That trust and confidence would give Breeden the flexibility to run the SEC his way.